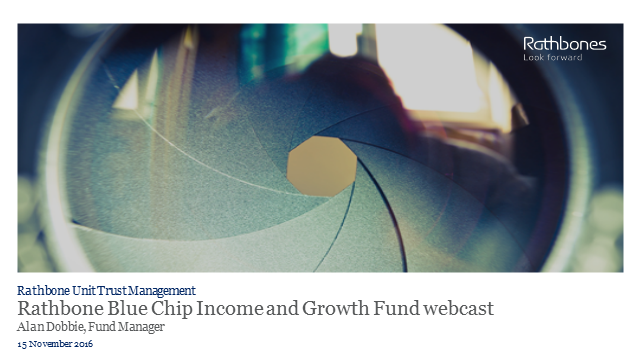 Please join Alan Dobbie, manager of the Rathbone Blue Chip Income and Growth Fund, on Tuesday 15th November at 11am for our live webcast. The fund has performed well over recent years, delivering first quartile returns over 3 and 5 years. Alan will discuss some of the drivers of this performance, as well as addressing whether the recent rise in bond yields and inflation expectations marks an important inflection point for equity market sector and stock leadership. Put your questions to Alan in advance, or during the call using the ‘questions’ tab at the top of the video screen. A recording will be available 'on demand' after the call if you are unable to join us at 11am.